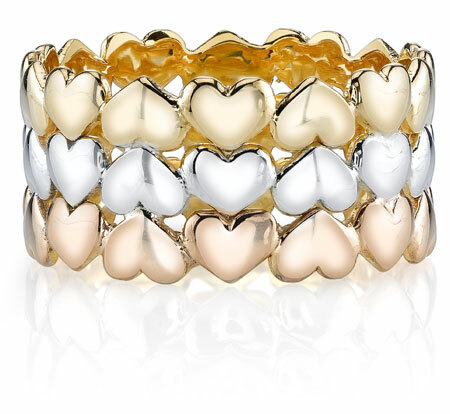 14K White, Rose and Yellow Gold meet up to make a 12mm wide stunning heart band. Not one, not two, but three rings of petite sculpted hearts comprise this Triple Heart Wedding Band Ring in 14K Tri-Color Gold. Each of these rings is crafted from a different variety of gold: 14K yellow gold, 14K white gold and 14K rose gold; these three colors allow this ring to coordinate with any jewelry collection and complement any engagement ring. This tri-color wedding band provides the look of three layered rings with the ease of a single, perfectly-coordinated piece. From a distance, this piece might appear to be a set of striped wedding bands that combines three colors of gold, but upon closer examination it becomes clear that each of these stripes is actually a row of hearts that snuggle closely together to form an unbroken ring, working together to create a picture of your ever-present love. Hearts are instantly recognizable as symbols of love, and a total of 42 of these emblems of affection are used to create this ring like the squares of a gleaming patchwork quilt. The message of this tri-color wedding ring is unmistakable as these hearts proudly declare your love. This sweetly-styled band possesses timeless charm and creates an even more timeless reminder of your never-ending affection. We guarantee our Triple Heart Wedding Band Ring, 14K Tri-Color Gold to be high quality, authentic jewelry, as described above.